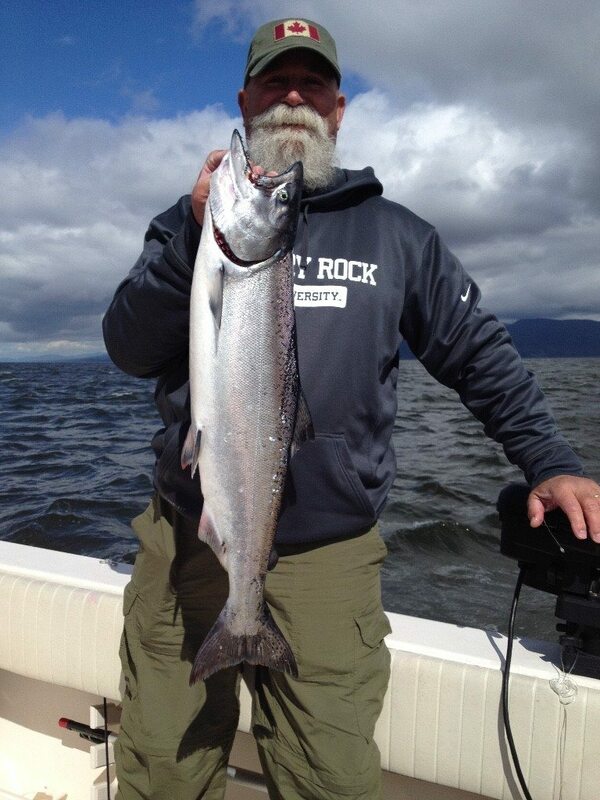 Oliver’s guest with a beauty fish landed at the Bell Bouy this Thursday. The fishing this past week at Thrasher was nothing short of world class. Double-headers and triple-headers earlier in the week kept our guides and guests busy but it did slow down a bit these last few days. This was to be expected as it was absolutely red hot for about 10 days in a row, so it has to slow down eventually. Even on the slower days, it was still very good fishing, we just got spoiled there for a week, so what we were calling slow is actually very good on a normal season. The fishing should remain solid as we enter May. 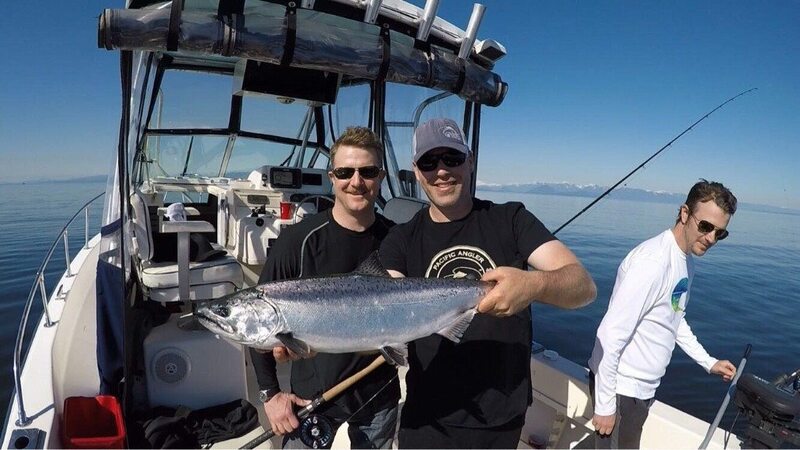 We usually have some of the best fishing mid May and into June, so we are only just getting started. If you are heading over to Thrasher, we have been doing well offshore in 600-800 feet of water and 120 to 160 on the downriggers. Great fishing, sunny skies, flat calm water. It doesn’t get much better than that at Thrasher Rock. On our shorter trips this week we were doing well closer to home around the Bell Buoy, QA and the Hump. These areas will continue to produce all of May, in particular the Hump. Our best depths in these areas have been 90-120 on the downriggers. Captain Eddie’s guest with his birthday fish. What a way to celebrate! In both of these fisheries we have been doing well on a variety of flashers and spoons. Our top producing gear for these fisheries are this week’s feature product. Check out the feature product section above for details and be sure to come the shop to get all the gear on sale on our “Guides Choice Wall”. Crabbing has been decent as well and we have been dropping traps on all our trips. 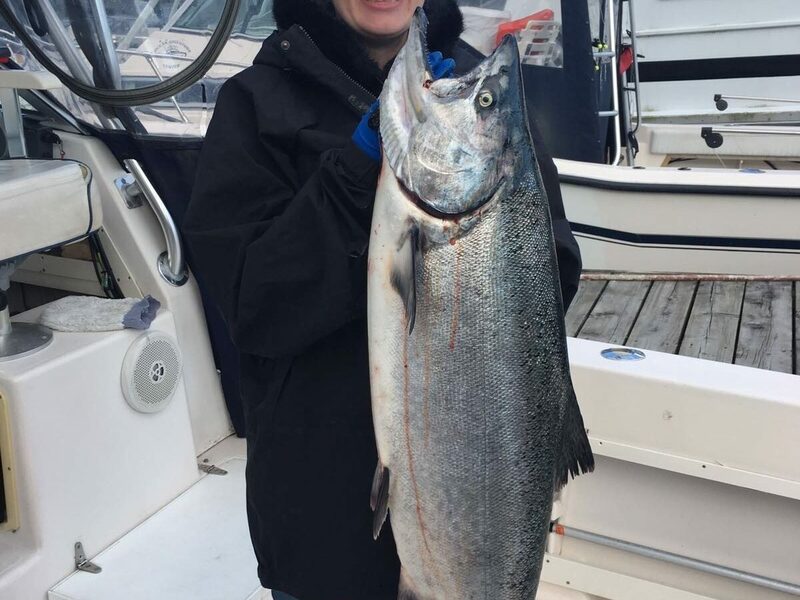 If you would like to head out and catch some nice chinook salmon and some Dungeness crab, give us a call at 778-788-8582.